On November 28, 2017, within the framework of the 28th session of the Energy Charter Conference, the Minister of Foreign Affairs of Turkmenistan R. Meredov met with Ambassador Extraordinary and Plenipotentiary of Cuba to Turkmenistan (with residence in Baku) Alfredo Nieves Portuondo. During the meeting, expressing satisfaction with the current state of cooperation in the political and diplomatic sphere, as well as within the framework of international organizations, the sides expressed their commitment to the development of trade-economic and cultural-humanitarian cooperation. 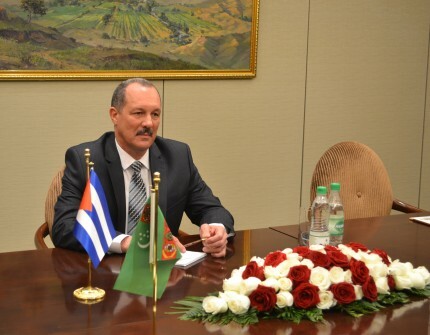 Touching upon the political bloc of relations, the Cuban side expressed satisfaction with the peaceful policy of Turkmenistan's positive neutrality, confirming the continued support of the Cuban side of international initiatives to strengthen peace and security put forward by Ashgabat on the UN platform and other international organizations. The parties also agreed on expanding cooperation between foreign ministries. In addition, the sides discussed the possibility of coordinating joint efforts to organize meetings between the heads of the two states, with a view to imparting additional impulses to the development of bilateral interaction. During the meeting, the sides paid attention to the issues of expanding relations in the trade and economic area. They considered the existing opportunities for establishing direct contacts and deepening cooperation between the business circles of the two countries through the organization of joint events. The sides noted interest in establishing close contacts in the cultural and humanitarian sphere, in particular in the sphere of education, sports, tourism and health. At the end of the meeting, the sides confirmed their commitment to the conclusion of bilateral ties to a higher level, which meets the long-term interests of both countries.